The famous moai of Rapa Nui (also known as Easter Island) are, to many people, the face of archaeology. 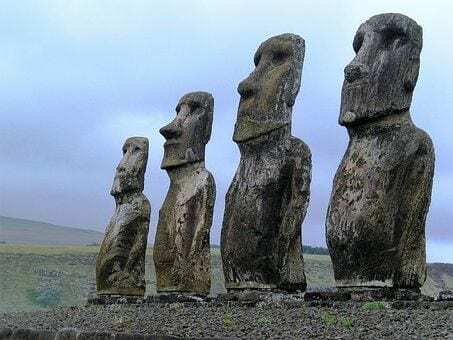 These massive statues made of dark, weathered stone, occasionally speckled with pale lichen, stare out across their island in the blue waters of the south Pacific. Their heads are oversized compared to their bodies, which gives them a dignity appropriate to their age; the oldest were crafted around 1200 CE. But the moai may not stand on Rapa Nui for much longer. They’re in danger from a very 21st century threat: climate change. Warmer temperatures will lead to a rise in the level of the oceans, with some researchers predicting we might see them climb by more than three feet by 2100. That probably doesn’t sound like much, but many major cities will be threatened by even such a small rise, from New York City and Miami to Shanghai, Rio de Janeiro, and Mumbai. Humans like to build our homes near the coast due to its easy access to water and other natural resources, and we always have. That’s why it’s not only our future that climate change threatens; humanity also stands at risk of losing much of our past. On Rapa Nui we’ve already begun to witness the consequences. It’s a small island, only 15 miles wide, and rising sea levels have increased erosion along the coast where many of the moai are located. In 2017, waves knocked down an ancient stone wall protecting a moai at Ura Uranga Te Mahina. That same year human bones were exposed near the beach at Hanga Roa, where the ocean broke open a platform containing burials, stone tools, and parts of a moai. Matters are expected to get worse as sea levels continue to rise. Rapa Nui is an attention-grabbing example, but it’s not the only site at risk. Globally, there could be thousands or even millions of other endangered archaeological sites. We can’t even begin to protect them until we have a complete list of their locations and positions relative to the ocean. Thankfully, two teams of scientists have set out to solve that problem. The first team, led by David G. Anderson from the University of Tennessee, focused on the southeastern region of the United States. They analyzed data from the Digital Index of North American Archaeology (DINAA), an open-source multi-institution GIS (Geographic Information System – basically a database linked to a map). Archaeological sites have been and continue to be excavated by a wide range of researchers, from land managers at state or federal agencies to professors from public or private universities to archaeologists working for construction companies or local historical societies. Their results are often unseen or hard to access by researchers from other sectors. Even when they are shared, it’s often in the form of isolated facts and figures, incompatible with anyone else’s method of data collection. DINAA works to change that by compiling all of the many sources of archaeological data into a single, unified GIS and making it available to researchers, government resource managers, and the public. DINAA’s existence made it possible for Anderson and his team to search for archaeological sites along thousands of miles of coastline, running all the way from Maryland to Louisiana (Mississippi was excluded from this study because its data was unavailable). Publishing in 2017, they announced that 32,898 recorded archaeological sites stand to be destroyed by a sea level rise of more than 16 feet, and 19,676 of those would be in danger from a rise of only three feet. Many of these sites have never been excavated; they contain unknown levels of information on matters such as the first arrival of humans in the region, how and why they adopted agriculture, and the details of contact between Native Americans and Europeans. One of the sites in danger is Fort Sumter, widely regarded as the place where the Civil War began. Located on a small, low-elevation island in the harbor of Charleston, SC, 100 percent of Fort Sumter would be lost by a sea level rise of three feet. Washington DC is another low-lying city, and one threaded through by the Potomac river, which will experience higher tides and more frequent flooding as sea levels rise. This puts sites such as the Lincoln and Jefferson memorials, not to mention the White House itself, in danger from climate change. Of course most of these thousands of sites are not so famous, but they can still be deeply important to modern Americans. For example, the DINAA database includes 6,897 historical cemeteries, and even that number is only a fraction of all the cemeteries in the US. Families will likely want the places where their ancestors are buried to be protected or transferred away from rising oceans. They may even refuse to move for their own safety if it means abandoning a loved one’s grave. Any plan for relocating people due to climate change needs to consider the importance of these cemeteries and other sacred sites. And matters are worse than they sound: 32,898 is only the number of recorded sites. An unknown additional number of sites still wait to be found. Fortunately, the southeastern United States has received many decades of organized, scientific archaeological research, which has been complied into a well-funded and managed GIS like DINAA. Other regions of the world have been less lucky. Mark D. McCoy from the Southern Methodist University is working on one such understudied region: Polynesia. Consisting of over 1,000 islands controlled by at least 10 countries, Polynesia contains some of the most fascinating archaeology in the world, including Hawaii, Samoa, Tonga, and Rapa Nui itself. Despite this rich background, very little of Polynesia has been systemically surveyed or excavated by archaeologists. In fact, McCoy found that only one area in the whole region had a tool comparable to DINAA. This was the country of New Zealand, where the New Zealand Archaeological Association maintains ArchSite, a archaeological GIS open to both professional researchers and the public. McCoy used ArchSite to locate sites vulnerable to sea level rise and published his results in Sustainability in January of 2018. He predicts that at least 8,250 New Zealand sites will be impacted by a sea level rise of more than 16 feet. That number is over 12 percent of all of the recorded archaeological sites in New Zealand. Half of them, or 6 percent of all sites, will be flooded by a rise of only three feet. Although not included in ArchSite, Hönaunau is another Polynesia site threatened by climate change. A political and religious center built in the 1200s CE on Hawaii, Hönaunau was the home of a long line of royalty, as well the location of a temple, a mausoleum for the dead, and a site of sanctuary and refuge for commoners who had broken laws or warriors who had been defeated. It suffered damage in the Japanese tsunami of 2011, when storm surges toppled ancient walls, flooded ponds, and closed roads. That catastrophic event saw waves reach more than three feet above the current sea level, giving archaeologists a brief glimpse of the higher waters that may soon become routine. Although the future of the past looks bleak, both teams of archaeologists agree that not all hope is lost. They call for increased coastal surveys so that researchers can better document vulnerable sites. Once sites are located, time and resources should be focused on excavating or recording those most in danger. Finally, archaeologists must continue to improve how we share our findings. Both Anderson and his team and McCoy relied on preexisting GISs that were not built with climate change in mind. Nonetheless, having information about sites’ locations available in a single, centralized database allowed them to address this new problem. Resources like ArchSite in New Zealand and DINAA in the US mean that large-scale issues like climate change can be responded to in an organized, well-informed manner. They deserve more funding and recognition. Ironically, it may be a technology of the 21st century like online, open-source GISs that allows us to save our past from the devastation of climate change. Patty Hamrick is an archaeologist from New York. This article was originally published on massivesci.com. For the original click here.